This piece appeared on VICE in September 2014. I always imagined private detectives as shadowy figures in long dark coats and impractically large hats. So seeing Glenn Mulcaire – the private detective hired by the News of the World to hack voice messages – has ruined the romance somewhat, looking, as he does, like an ageing Take Me Out contestant. Fortunately, in France the private detective still enjoys a respectable status, with family agencies occupying offices on the high street and advertising online. 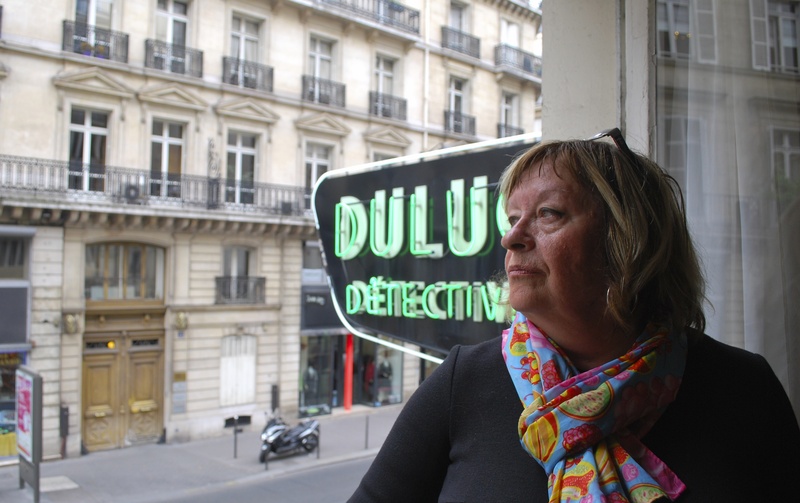 I first came across one on a trip to Paris, spotting a large neon sign – “Duluc Detective” – hanging over a perfume shop on the Rue de Louvre. Martine Baret, the 66-year-old who runs Duluc, told me she inherited the agency from her father, who’d inherited it from his father, who’d founded the business in 1913. She also told me that times are tough for the French gumshoe. Once a thriving profession of more than 2,000 people, there are now less than 800 private investigators like Madame Baret working in France. I asked Madame Baret about her half-a-century career as a detective, and how things have changed over time. VICE: Bonjour, madame. When did you begin your career as a private detective? Martine Baret: I started to work here in 1966, when I was 18, and my father was happy to work with me. I adored the work. I still love it. It’s always different – you meet such interesting people, and you get a glimpse of all kinds of society. I still get excited by every case.